President Barack Obama has appointed one of his closest national security advisers and self-described architect of the administration’s pro-Iran diplomacy to a post on the U.S. Holocaust Memorial Museum’s council, according to the White House. 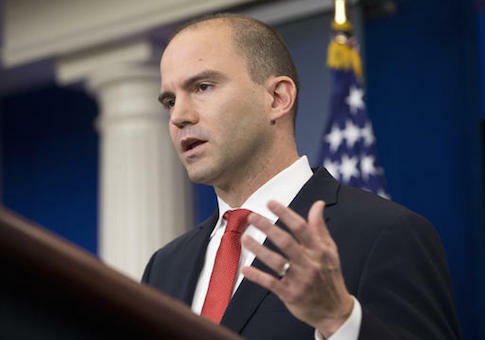 Obama on Tuesday selected Ben Rhodes, White House deputy national security adviser who led the administration’s efforts to mislead Congress about the terms of the Iran nuclear agreement, to a seat on the Holocaust museum’s council. Rhodes has been the focus of a congressional probe following revelations he was denied security clearances after failing an FBI background check in 2008, the Washington Free Beacon first reported earlier this month. "I am proud that such experienced and committed individuals have agreed to serve the American people in these important roles. I know they will serve the American people well," Obama said in a statement accompanying the latest postings, which also included spots for White House confidantes Valerie Jarrett and Susan Rice to serve on the John F. Kennedy Center for the Performing Arts’ Board of Trustees. This entry was posted in Issues and tagged Ben Rhodes. Bookmark the permalink.